Tens of thousands of Iraqis have fled the town of Sinjar and its surrounds in northwestern Iraq after an attack carried out by ISIS militants. Most are trapped on a nearby mountain, desperate for aid, while hundreds more are missing, feared dead or abducted. “The civilians trapped in the mountain area are not only at risk of being killed or abducted by ISIS; they are also suffering from a lack of water, food and medical care. 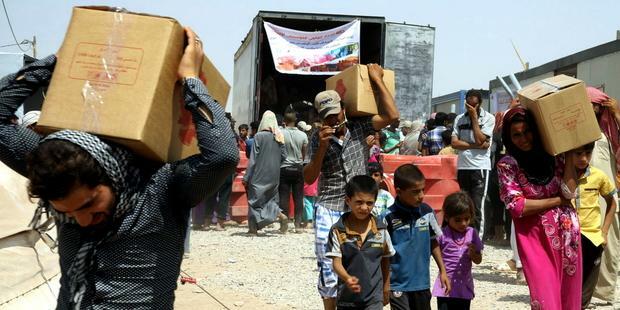 They are in desperate need of humanitarian assistance,” said Donatella Rovera, Amnesty International’s Senior Crisis Response Adviser, who is currently in northern Iraq. As of today, the US is carrying out aid drops to those in need, but has also authorized air strikes on ISIS, hoping to weaken their resources and help the Iraqi military. Most of the affected people belong to the Yezidi minority who are a target of ISIS. Yesterday President Obama said ISIS’s threats against them had the potential for „genocide“. According to Amnesty International, the Yezidi community in Iraq has long been persecuted for their pre-Islamic religion. Muslims often refer to them as “devil worshippers”. Yezidis, as well as Christians and other minorities, are all vulnerable to ISIS attacks. Another minority trapped in the conflict is Kurdistan, which has so far kept the cities under its control closed to the fleeing Yezidis hiding right on their doorstep. Amnesty International has urged the autonomous region to those seeking refuge. “The plight of displaced people caught up in fighting in Iraq is increasingly desperate and all parties to the conflict must do more to ensure their safety,” said Donatella Rovera.